Personal Income Tax (PIT) is perceived as the most progressive tax available for state revenues. Compared to Property and sales taxes, PIT adhere the “ability-to-pay” principle because -most of the times- the effective rate applied represents a percentage of the gross personal income (ITEP, 2005). Whereas in Property taxes home values represent a much larger portion of the income in poor families than it does for rich families (ITEP, 2011), PIT is a function of gross personal income, which basically means that the tax goes up or down by considering a reflection of individual economic activity. Additionally, regardless the type of tax base, the tax unit or the jurisdiction, Personal Income Taxes do not fall misled by the market fluctuations as property taxes do (ITEP, 2005). Also it allows the State to enlarge the width of taxpayers. Therefore, Personal Income Tax represents apparently the fairest way to tax and at the same time enlarge the State revenues. In a State in which more than 70% of its revenues are collected from PIT and Property taxes, analyzing PIT isolated from the rest of the taxes may lead analyst to the wrong conclusion. Any analysis that takes PIT out of context of the general structure of taxes may conclude that the system is fair to the poorest segment of the society. However, looking at the overall picture the conclusion varies to infer the opposite. The following chart shows the progressivity of PIT in Massachusetts. It is possible to suppose from there that the top 20% of the population pays more in PIT -considering its ability to pay. However, it is also true that Property and Sales taxes affect heavily the lowest 20% of the population. On the other hand, the next element to consider is the structure of Massachusetts State and local taxes (fiscal year of 2008). 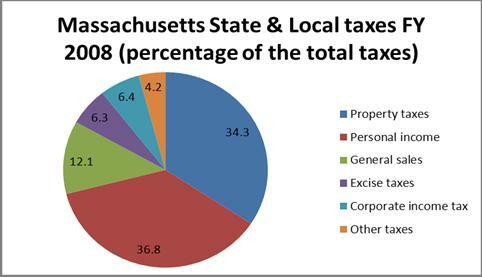 As the pie chart shows Massachusetts Property taxes represent a 34.3% of the state revenues; However, Personal Income Taxes represents 36.8 percent; General sales are in 12.1% with Excise taxes at 6.3%; corporate income tax 6.4% and finally other taxes 4.2%. Clearly, more that 70% of the State’s funds come from these two sources: PIT and Property taxes. It is important to acknowledge that Property taxes are lower than PIT as a source of revenue. However Property is still high. Furthermore, if we consider that Landlords may transfer property taxes via Rent prices (ITEP,2011), it is feasible to conclude that poor people is also contributing heavily to the 34% of Property taxes amount, which are allegedly paid by rich people. Apparently the system is balanced by the progressivity of the PIT and by the ability-to-pay principle. But it is not. 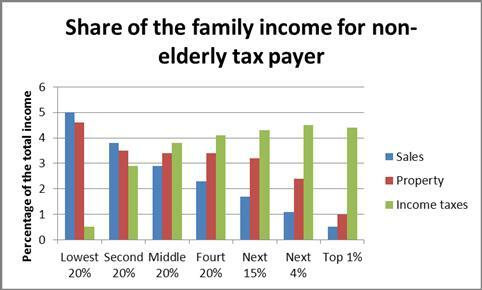 The second information we should consider is the share of income for all families in Massachusetts. Chart number three shows how the lowest 40% of the families pay roughly a 10% of their income while the top 1% pays less than 5%. The disparity is pulled up against low-income families by the effect that Property and Sales taxes have in the total. It is clear that although low-income families pay less in PIT, the general structure and other taxes affect negatively almost a 40% of the population. In fact as we mentioned above “when residential rental property is in short supply, landlords are more likely to pass their property taxes on to renters in the form of higher rents. But if rental property is abundant, Landlords may find this more difficult” (ITEP. 2011). Guided by the rent prices in Massachusetts, it is feasible to infer that residential rental property market is dominated by the Landlords; therefore the Property tax is being transferred to the tenants, who usually are poor people. Understanding PIT’s advantages in the context of Massachusetts tax system leads any analysis to a twofold conclusion. First, although the state taxation system relies notably on property taxes it does more on PIT. And second, in the overall results low income families in Massachusetts fund the local revenues because the regressivity of Property and Sales taxes has a major incidence in low-income families than the progressivity of Personal Income Tax does. Institute on Taxation and Economic Policy, ITEP Guide to Fair State and Local Taxes, , 2011, Chapter 4. Download report or chapter http://www.itepnet.org/state_reports/guide2011.